NASA's Hubble Space Telescope in Earth orbit. 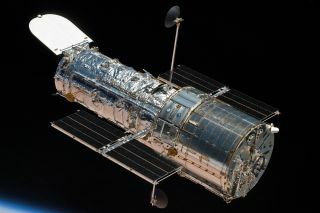 The Hubble Space Telescope is back. The iconic scope resumed normal operations Friday (Oct. 26) after a three-week hiatus caused by issues with two orientation-maintaining gyroscopes, NASA officials announced in an update Saturday (Oct. 27). Hubble's troubles began Oct. 5, when a gyro failure sent the telescope into a protective safe mode. Mission team members worked to recruit a backup gyroscope but had trouble doing so, because the gyro returned anomalous readings — specifically, it measured rotation rates that were higher than the actual ones. "Last week, the operations team commanded Hubble to perform numerous maneuvers, or turns, and switched the gyro between different operational modes, which successfully cleared what was believed to be blockage between components inside the gyro that produced the excessively high rate values," NASA officials wrote in Saturday's update. Further testing and monitoring showed that the gyro was acting normally, so the mission team brought Hubble back online. Hubble has a total of six gyroscopes, three of which need to be functional for the scope to work at maximum efficiency. Two Hubble gyros had previously conked out, so the Oct. 5 failure eliminated the scope's margin of error. But that doesn't mean that fixing the backup gyro was a matter of life or death for Hubble. The scope can still make valuable observations in one- or two-gyro mode, NASA officials have said. If the backup had continued to misbehave, the mission team likely would have gone to one-gyro mode, with the other functioning gyroscope in reserve as a backup. Hubble, a joint mission of NASA and the European Space Agency, launched to Earth orbit in April 1990 aboard the space shuttle Discovery. The telescope's initial images were blurry because of a slight defect in its primary mirror, a problem that spacewalking astronauts fixed in December 1993. Astronauts further repaired and upgraded Hubble on four additional servicing missions. The last of these, in May 2009, featured the replacement of all six gyroscopes. A gyro problem also recently sidelined NASA's Chandra X-ray Observatory, which launched in 1999. But Chandra bounced back last Sunday (Oct. 21), after its handlers established a new gyroscope configuration.